A former governor of Osun State, Prince Olagunsoye Oyinlola, has described veteran comedian, Moses Olaiya Adejumo, better known by his stage name, Baba Sala, as a hard-working humour merchant whose achievements and contributions to Nigeria’s entertainment industry should inspire contemporary filmmakers. Oyinlola, in a condolence message, said the death, on Sunday night, of Baba Salamarked the end of a golden era in the movie industry and urged the younger generation of artistes to honour the memories of Adejumo and other great acts that had predeceased him by carrying the torch and consolidating their accomplishments. According to the former governor, the talent of the deceased, especially in the prime of his career, spoke volumes as he lifted the souls of movie enthusiasts through his rib-cracking jokes. “We mourn the loss of our dear baba. Chief Moses Olaiya Adejumo was a rare-breed comedian who was imbued with the ability of cheering up even the most melancholic. He filled many homes with happiness. Even the anticipation of his television shows in those days threw people in happy spirits. “I had the privilege of being close to him and his works while I was governor of Osun State. 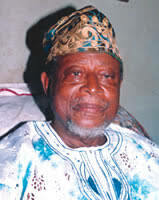 He was a gem who, among others, helped put Osun State and Yorubaland on the world entertainment map. “I pray the good Lord to bless his gentle soul and grant his family and the rest of us the strength to carry on without his fatherly affection and uncommon humour,” Prince Oyinlola said.